Many believe that physical attributes and facial features convey essential information about a person. This perception is the case in real life and certainly in photographic images. Physical and facial characteristics communicate to the viewer not only the identity of the person but also give clues about his or her gender, age, ethnicity, race, mood, and level of athleticism, among other qualities and characteristics.Viewers use these physical characteristics to make a variety of judgments about the subjects of the photographs, such as attractiveness and intelligence. Research supports this assertion that physical appearance can significantly impact the perception of individuals in photographs. For example, Body Mass Index (BMI) not only of the target person in the photograph but also of the participants who rate them significantly affects social desirability perceptions (Conley & McCabe, 2011). Hair color and skin tone affect perceptions of the fertility and health of women (Swami, Furnham, & Joshi, 2008), whereas the presence of glasses, hair, and beards alters social perceptions of men. Glasses are associated with intellectualism and goodness, baldness with idealism, and beards with unconventionality and goodness; these three variables also affect the perception of occupation (Hellstrom & Tekle, 1994). Adults with “babyface” (i.e., chubby, rounded) features are perceived to be warmer, more submissive, more honest, less physically strong, and more naive than are those with more mature facial features (Berry & McArthur, 1986). These studies suggest the power of physical appearance and visual stimuli on social perceptions of personality, particularly in photographs. The research cited above indicates that there are many obvious visual cues that people use to assess characteristics about a person. However, what happens when images are edited and manipulated in subtle ways to create different physical cues that are more favorable? What happens when, rather than changing the individual’s physical features (e.g., presence of glasses, hair color), the visual sensory aspects of the photos themselves (e.g., shading, color) are edited and/or altered to create a more favorable overall appearance? This issue is particularly relevant when viewing photographs, especially those in magazines and model/actor portfolios. Photographic editing can have a significant effect on the viewer’s preference or aesthetic enjoyment of both the picture and the people portrayed within it. Cropping and tampering with the contrast, sharpness, and grain can lead to a preference of one photo or another (McManus et al., 2011; Tinio, Leder, & Strasser, 2011). Shadows, shading, and light orientation are three photographic qualities that affect three-dimensional visual processing and, therefore, facial recognition. By manipulating lighting direction, lighting inversion, and brightness reversal, researchers discovered that figurally inverted (i.e. rotated upside-down) faces and faces lit from below were less easily recognized than were non-inverted faces and faces lit from above (Johnston, Hill, & Carman, 1992). When facial recognition is assessed in terms of the configural arrangement of eyes, nose, and mouth, precise arrangement of these features is no more significant than is a generic configuration (Balas & Sinha, 2008). The manipulation of face color information (i.e., whether the image is in color or in black and white) also affects the ability to assess facial recognition (Young, Man, & Konstantinos, 2011). Whether photographic manipulation can actually influence the social perceptions of the subjects within the picture is another question. Recent research has focused on the aesthetic quality of photographs, including variations in visual sensations like shading, color, and shape. The results of these studies suggest that many photographic variables are important in social perception of characteristics such as attractiveness and intelligence. Not only does digital aesthetic alteration of photographs lead to a preference of one picture over another, but also to a preference of one photographic subject over another. The luminance (the lightness or darkness) of the photograph appears to be particularly important. When the luminance of the eyes and mouth are manipulated in Adobe Photoshop, people perceive more or less attractiveness, at least with regard to women (Russell, 2003). Greater darkness around the eyes and mouth compared to the rest of the face led photographic subjects to be perceived to be more feminine than masculine (Russell, 2009). Russell suggested that the cosmetic industry plays upon this fact; makeup often results in similar effects as eyes are darkened with eye shadow and lips with lipstick, and highlights are made around the rest of the face. Another study also indicates that judgments of intelligence and personality are significantly impacted by the digital manipulation of the luminance of photographs but not by negation (reversing the positive and negative values, and vice versa) and inversion (rotation) of facial photographs (Santos & Young, 2008). Digital manipulations of shape and color variables can affect the perception of the age and health of individuals in a photograph. Increasing the color range (RGB color) and blending components from different faces significantly impacts perceived age, but enhanced contrast and color saturation does not (Burt & Perrett, 1995). Subtle computer alterations in facial symmetry affect social perception in congruence with perceptions of health. Facial symmetry significantly affects ratings of neuroticism, agreeableness, and conscientiousness (Noor & Evans, 2003). Even if a person is recognizable (e.g., the President of the United States), subtle digital manipulations in the size of the eyes and lips of photographic subjects significantly impact social perceptions of warmth (e.g., honesty, attractiveness, compassion) and power (e.g., dominance, strength, cunning) (Keating, Randall, & Kendrick, 1999). In addition, angles of lighting elicit different interpretations of the subjects as friendly, strong-willed, frightened, and/or pessimistic (Fueg, 1971). Finally, the digital alteration of body size, as well as the manipulation of specific body parts, significantly impacts participants’ perceptions of body image satisfaction (Sands, Maschette,& Armatas, 2004). Despite research that supports photograph manipulation effects on the interpretation of photographic subjects, the number of studies remains limited. One area that needs further exploration is the effect of three specific photographic elements pertaining to luminance and color (i.e., contrast, hue saturation, brightness) on the perception of personality characteristics. Research was conducted on these three specific effects because they seem to be the most well-known and most frequently manipulated photographic elements. They are also elements that have not been sufficiently studied. It was hypothesized that participants exposed to an image with optimal contrast, hue saturation, and brightness would rate the photographic subjects’ personalities significantly differently on the Big Five Inventory and would rate them as more attractive on a 7-point rating scale than would participants in a control group who were exposed to the same photographs with average contrast, hue saturation, and brightness. The research was an experimental, between subjects design with one independent variable (type of photograph manipulation), with four levels (no manipulation, contrast manipulation, saturation manipulation, and brightness manipulation)and two dependent variables (ratings of attractiveness and ratings of personality). Each participant was randomly assigned to one of the four cells. A fourth of the participants were in the “no manipulation” control group, where none of the photographs were altered. The remaining participants were divided between the“contrast manipulation” group, the “saturation manipulation” group, and the“brightness manipulation” group. Sixty introductory psychology students (15 in each condition) at Connecticut College received 30 minutes of course credit for their participation. They were participants were recruited through a signup sheet on a bulletin board in Bill Hall. Of the students that signed up to participate, six neglected to show up to the allotted session. None of the participants objected to the research or opted out of the study. Most of the participants were 19 to 20 years old, women, college sophomores, straight/heterosexual, White/Caucasian, and had either no religious affiliation or were affiliated with some sect of Christianity. Further demographic information, including ns and percentages, are included in Table 1. Participants rated photographic subjects on personality characteristics using a shortened version of the Big Five Inventory (BFI-10). The original BFI (John, Donahue, & Kentle, 1991)contains 44 items, and the shortened version contains 10 (Rammstedt & John, 2007). The BFI-10 assesses the Big Five personality characteristics: extraversion, agreeableness, conscientiousness, neuroticism, and openness to experience. The BFI-10 was slightly altered for this study because the original version is self-evaluative; two words were altered to indicate that participants were to rate another person. Using this scale, participants rated a statement on a scale of 1 to 5, where 1 indicates “disagree strongly” and 5 indicates “agree strongly.” A sample statement is, “I see this person as someone who…is reserved.” These ratings were then turned into scores on each personality trait. The five domains in the original BFI-44 – Neuroticism (α = .72), Extraversion (α = .85), Openness (α = .75), Agreeableness (α = .88), and Conscientiousness (α = .84) have high internal consistency (Noor & Evans, 2003), and previous research (Rammstedt & John, 2007) found that the BFI-10 had a total correlation with the BFI-44 of .86 for Neuroticism, .89 for Extraversion, .79 for Openness to Experience, .74 for Agreeableness, and .83 for Conscientiousness), which suggests that this shortened scale also has high internal consistency. In the present study, the Cronbach’s alpha values for the BFI-10 were relatively low for the subscales, Neuroticism (α = .48), Extraversion (α= .31), Openness to Experience (α = .43), Agreeableness (α= .52), and Conscientiousness (α = .71). Given that each subscale is composed of only two questions, somewhat low alphas are to be expected. Although the BFI-10 includes less than 25% of the full BFI-44 scales, previous research has determined that it predicts almost 70% of the variance of the full scale (Rammstedt & John, 2007). Mean test-retest stability correlation coefficients were reported in other studies as r = .72 for the English version and r = .75 for the German version over a 6-8 week period (Rammstedt & John, 2007). The test also has external validity similar to the BFI-44. Overall correlations of self-report ratings with peer ratings averaged .44, as compared to .56 for the BFI-44, which represents a loss only of r = .16 in external validity (Rammstedt & John, 2007). A short one-item attractiveness scale was used to assess the participants’ ratings of each photographic subject. Participants rated the attractiveness on a scale from 1 to 7, where a rating of 1 indicated highly unattractive and a rating of 7 indicated highly attractive. The scale was modeled it after Noor and Evans’s (2003) attractiveness scale. Ten headshot photographs were collected for this study. White, college students were recruited at the State University in New York (SUNY) – New Paltz through a snowball sample, which originated with a contact of the researcher. Five photographs were of men, and five were of women. Each student was approached by the researcher with a request for a quick headshot for a psychology research project and a consent form. There was a 100% acceptance rate. Each person signed a consent form to allow his or her image to be used in this study and briefly stated the purpose of this research. In order to maintain uniformity of the pictures and exclude any extraneous variables, each photograph was taken with the same Nikon D700 camera, with an “automatic”setting, against a white wall, with flash, and during daytime. Each photograph was taken from the same distance and composed with the same horizontal orientation, and each student was asked to retain a neutral expression. Each photograph was edited through Adobe Photoshop. Versions were made in which only contrast, only color saturation, or only brightness was manipulated. A photography student at SUNY – New Paltz was consulted on the suitable level for each variable, so as to increase the aesthetic appearance of each photo with without overt changes in photographic quality. Contrast was increased by 40%, saturation was increased by 50%, and brightness was increased by 50%. Contrast was defined as the range of difference between the dark and light aspects of the photograph. In a high contrast image, the highlights were brighter and the shadows were darker. Color saturation was defined as the density of hue in a color. A more saturated image had a greater percentage of hue. Brightness was defined as the intensity of light that is associated with the amount of gray in the middle ranges of the image. A brighter image had fewer gray tones in the middle ranges. The photographs were arranged in four separate PowerPoint presentations. They were organized and presented in random order in each presentation. A demographics questionnaire was given to the participants in order to record their ages, genders, races/ethnicities, class statuses, religious affiliations, and sexual orientations. This information was used to assess how representative the sample was of the population of the United States in general and whether the experiment had external validity. All of the experimental conditions required a computer. Thus, the required the experiment was conducted in a classroom in Bill Hall. Signup sheets were posted on a bulletin board in Bill Hall. The researcher randomly determined beforehand what experimental condition would be carried out at which time. When the students signed up, they did not know to which experimental condition they were assigned. The experiment consisted of four conditions: no manipulation, contrast manipulation, color saturation manipulation, and brightness manipulation. Upon their arrival at the classroom, participants were asked to give their informed consent. All participants were given the same instructions (see Appendix I) and questionnaires. Each participant received a packet with (in order) a sheet of directions, 10 copies of the BFI-10 (one for each photograph), 10 copies of the attractiveness scale, and a demographics questionnaire. Participants were able to look at the individual images on their own computer screen after downloading a PowerPoint presentation sent to them by the researcher through email. The photographs were not projected on a screen in the front of the room because, after initial observation, the projector compromised the quality of the photographs. Participants looked at each photograph for as long as they needed, and then filled out the corresponding questionnaires. The procedure was the same for each condition, except for the versions of the photographs each subject was shown. Participants in the control condition were exposed to headshots that had not been altered. These photographs were not retouched by the researcher nor uploaded to Photoshop. Participants in the three other conditions were exposed to the same headshots, but each headshot was manipulated to alter the aesthetic experience of the photograph. The second condition contained photographs with enhanced contrast, the third contained those with enhanced color saturation, and the fourth contained those with enhanced brightness. After having viewed each photograph and completed each survey, the participants received a debriefing form. To evaluate the effect of photograph manipulation on social judgments, a one-way MANOVA was conducted with multiple dependent variables: attractiveness and the Big Five personality traits (Extraversion, Neuroticism, Agreeableness, Conscientiousness, and Openness to Experience). Ratings of attractiveness and ratings of personality traits on the BFI-10 were hypothesized to differ between the no manipulation condition, the brightness condition, the contrast condition, and the hue saturation condition. Specifically, the researcher expected the no manipulation attractiveness ratings to be significantly lower, and personality ratings to be significantly different, than in the other three manipulation conditions. In order to reduce the number of analyses and the possibility of Type I error, analyses used each participant’s composite score of all 10 photographs’attractiveness ratings, Extraversion ratings, Neuroticism ratings, Agreeableness ratings, Conscientiousness ratings, and Openness ratings. Thus, all 10 ratings on the same dependent variable were added to obtain a total attractiveness score, total Extraversion score, total Agreeableness score, etc. To evaluate these hypotheses, a one-way MANOVA was conducted. The analysis indicated that there was no significant multivariate effect for personality traits and attractiveness, Wilks’s lambda = .663, F (18, 144.735) = 1.26, p= .226. However, an a priori hypothesis argued for examination of the univariate findings. Between-subjects tests indicated that there was a significant difference in ratings of attractiveness in the four conditions, F (3, 56) = 4.62, p = .006. Tukey follow-up tests indicated that those in the brightness condition rated photographic subjects as significantly less attractive than did those in the contrast condition (p = .040) and those in the hue condition (p = .016), but not than those in the no manipulation condition (p = .905). In addition, the differences between the no manipulation control condition approached significance for the color manipulation condition (p = .086), but not for the contrast manipulation condition (p = .179). There was no significant difference of ratings of attractiveness between contrast and color conditions (p = .985). Means and standard deviations are reported in Table 2. Between subjects tests indicated no significant differences between groups on ratings of Extraversion, F (3, 56) = 0.80, p = .499; Neuroticism, F (3, 56) = 0.26, p = .856; Agreeableness, F (3, 56) = 1.12, p = .350; Conscientiousness, F (3, 56) = 0.13, p = .940; or Openness to Experience, 1.52, p = .219. Means and standard deviations of composite personality ratings are reported in Table 3. The purpose of the present study was to examine the effects of photograph manipulation on ratings of attractiveness and personality. It was hypothesized that ratings of attractiveness and personality would differ if the brightness, contrast, or hue saturation of the photograph were changed from unedited photographs of average quality. The results revealed partial support for the hypothesis about attractiveness ratings. Composite ratings of attractiveness in the brightness condition were significantly lower than were composite ratings in the contrast and hue conditions. Composite ratings of attractiveness in the no manipulation condition were slightly lower than were those in the hue and contrast conditions, although they were not significantly so. However, the results of this study did not support the hypothesis about personality ratings. There were no significant differences in ratings of personality traits among the four conditions. These findings seem to contradict previous research on photograph manipulation that showed a statistically significant impact of photograph editing on personality judgments, and a significant positive effect on attractiveness (Keating, Randall, & Kendrick, 1999; Santos & Young, 2008). In their research, Keating Randall,& Kendrick (1999) chose to alter images in a more overt, noticeable way by digitally changing the shape of facial characteristics, which may have produced a more powerful effect than simply editing aspects of the photographs themselves (as was done in the present study). As in the present study, Santo and Young (2008) manipulated the visual information in the photographs, rather than the actual faces, through Photoshop technology. However, they found that the luminance of a photograph affected judgments of attractiveness, trustworthiness, approachability, and intelligence, and a manipulation of hue did not have an effect. The results of the present study contradict the results on Santos and Young. Hue seemed to have the greatest impact on perception, whereas increased brightness seemed to elicit perceptions similar to ones invoked by photographs with no manipulation. Santos and Young (2008) used a dichotomous rating scale with two options to assess the characteristics, whereas I used scales with multiple anchors, which could have played a factor in the contradictory results of these two studies. The present findings suggest that, first and foremost, appearance, as it is affected by photographic manipulation, is an important factor when processing a person’s attractiveness, so much so that subtle alterations can affect attractiveness ratings. Appearance, whether enhanced or degraded due to photographic manipulation, is taken less into account when judging personality. Many more factors go into personality, like manner of speaking and acting, whereas appearance and visual stimuli are the sole determinants of physical attractiveness. The findings regarding increased brightness were especially surprising, but could be a simple explanation. Brightness was increased by 50% without any other changes in the photograph. For that reason, the faces within the photograph might have appeared washed out. Increased brightness, without any other photographic manipulation, brings out much more light in photographs, which often makes skin appear paler. As all of the photographic subjects are White, this brightness might have increased paleness to such an extent that the brightness manipulation had an impact opposite to the researcher’s expectations. Previous studies indicate that a medium tan is perceived as healthiest and most attractive, and “no tan” is perceived as both least healthy and least attractive (Broadstock, Borland,& Gason, 1992). This pattern of preferring tan-skinned people could have caused these unforeseen results. There are a number of limitations to the present study, which could have affected the results. The homogeneity of participants is the most apparent factor. The participants may not have been representative of the general population. A similarity in responses, despite the different experimental conditions, could have caused the inability to reject the null hypotheses even if there could be a real difference in perception among the general public. The lack of diversity among participants further reduced the external validity of this experiment. 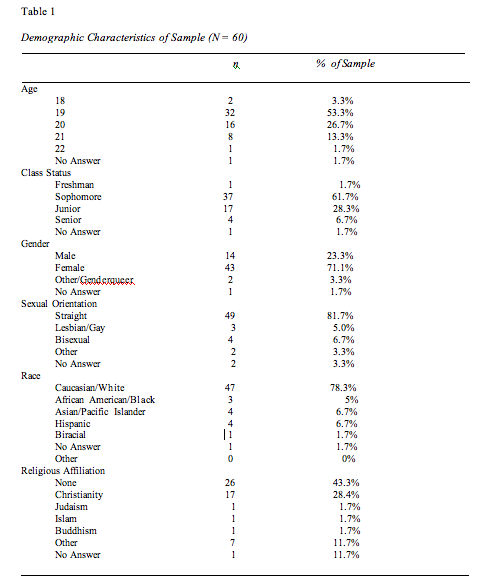 Limited conclusions can be drawn about perceptive tendencies of the general public based on the results of this study because the overwhelming majority of participants were White, female, college sophomores, ages 19 to 20. The scales used in the experiment could have reduced its internal validity. Although the BFI-10 was seen to be fairly reliable and valid in previous research, the Cronbach’s alphas of each scale were low in the present study. The use of a one-item assessment of attractiveness, although there was no precedence in the literature for a different method, also might have added to this problem of limited reliability because one-item scales are inherently unreliable. Furthermore, a few issues that limited the internal and external validities occurred during the conduction of the experiment. The researcher used a snowball sample to collect the photographs, and the physical features of these photographic could have affected participants’ ratings of them. All of the persons in the photographs were from the same college, were White, and were mostly art students who knew each other. These people were not randomly selected from the public, which may have influenced results. Several logistical issues also served as limitations to the experiment. The PowerPoint slides that the participants were provided with had different downloading durations. One of the versions took twice as long to download as did another version. The longer loading time could have resulted in frustration among the participants that had to stay at the computer longer than others, and that might have affected their ratings. Some participants also preferred to use their own laptops, rather than the computers provided in the classroom. This difference also might have affected the speed of the loading time as well as the quality of the photographs. In addition, as there was no time limit, participants could look at the photographs for as long or as short a time as they wanted, and time spent looking at the photographs could have affected scores. In order to address these limitations and reconcile the present study’s findings with those of previous studies, future research needs to be conducted. The research should be extended in order to address the combination of photograph manipulation effects. Photograph manipulations are rarely used in isolation of one another (as was done here) in the real world, so the interaction of different effects should be examined. It is very likely that the sole use of one effect makes a negligible difference in perceptions of attractiveness and personality. Instead, it is likely that the use of brightness, contrast, and hue saturation together creates a visual experience that influences perceptions in a much more powerful way than one effect alone. Future researchers could explore the levels of intensity of photographic effects. In the present study contrast increased by 40%, brightness by 50%, and hue saturation by 50%. What would happen if these effects were manipulated more or less? Would the results remain the same? Further directions of research could include different effects than the ones explored in the present study. There are many aspects of photographs that one can change using Photoshop (e.g., tone, skin pigmentation, sharpness, and grain) that have yet to be investigated to a substantial degree. One could even include a quasi-independent variable such as gender or race to assess whether Photoshop effects apply differently across photographic subjects. The plethora of ways in which Photoshop technologies affect human perception can shed light on the effect of visual cues on perceptions of people. Perceptions, judgments, and attributions made based on photographs have profound influences on all manners of interpersonal, social, and political decisions that affect great numbers of people. The inconclusive results of the present study should not discourage future researchers. After all, photographers, artists, magazine editors, politicians, and many others would not use these manipulation technologies if they did not appreciate the power of visual cues on viewers’ perceptions and the power of these perceptions to affect critical decisions in our individual lives. John, O. P., Donahue, E. M., & Kentle, R. L. (1991). The Big Five Inventory-Versions 4a and 54. Berkeley, CA: University of California, Berkeley, Institute of Personality and Social Research.